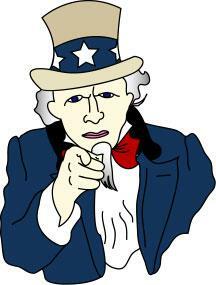 Uncle Sam, a figure symbolizing the United States, is portrayed as a tall, white-haired man with a goatee. He is often dressed in red, white, and blue, and wears a top hat. The exact origins of Uncle Sam as a symbol for the United States are unknown. But the most widely accepted theory is that Uncle Sam was named after Samuel Wilson. During the War of 1812, Samuel Wilson was a businessman from Troy, NY that supplied the U.S. Army with beef in barrels. The barrels were labeled "U.S." When asked what the initials stood for, one of Wilson's workers said it stood for Uncle Sam Wilson. The suggestion that the meat shipments came from "Uncle Sam" led to the idea that Uncle Sam symbolized the Federal Government and association stuck. In 1961, Congress passed a resolution that recognized Samuel Wilson as the inspiration for the symbol Uncle Sam. But Sam Wilson looked nothing like the Uncle Sam pictured above. Uncle Sam's traditional appearance, with a white goatee and star-spangled suit, is an invention of artists and political cartoonists. One of these political cartoonists was named Thomas Nast. Nast produced many of the earliest cartoons of Uncle Sam. The most famous picture of Uncle Sam appeared on an Army recruiting poster. The poster was designed in World War I, and was used again in World War II. The caption reads "I Want You for U.S. Army." James Montgomery Flagg drew this picture, and served as the model too! To learn more, check out the Library of Congress.